You'll enjoy a bit of beach vacationing at Playa Paraiso and Caleta Tankha Beach. Appreciate the collections at MiNiAtUrE art Gallery and Balam Art On Feathers. 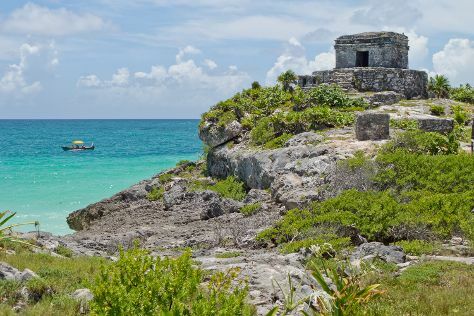 Venture out of the city with trips to Tulum (Mayan Beach, Ruins of Tulum, & more), Cobá Zona Arqueológica Cobá (in Coba) and Cancun (Mayan Museum of Cancun, La Isla Shopping Village, & more). Plan for a day of cool, family-friendly fun on the 18th (Mon) at Xel-Ha. Pack the 5th (Tue) with family-friendly diversions at Xplor. There's still lots to do: tour the pleasant surroundings at Akumal Beach, get interesting insight from Tours, admire the masterpieces at 3D Museum of Wonders, and view the masterpieces at Gaston Charo Art Gallery Playa del Carmen. To see ratings, maps, traveler tips, and more tourist information, use the Playa del Carmen travel planner . If you are flying in from Brazil, the closest major airports are Cozumel International Airport and Cancún International Airport. In February, plan for daily highs up to 31°C, and evening lows to 21°C. Wrap up your sightseeing on the 5th (Tue) early enough to travel back home.